The ‘Shop Contest returns this week with a blast from the past as we celebrate a long tradition of really lazy Bad Dudes entries. “You have some pretty bad dudes on the other side,” the President said earlier this week in his latest attempt to “both sides” white nationalism and Nazis. It’s not even the first time he’s invoked the phrase. The dude simply loves to talk about other bad “dudes.” Little did Trump know he was issuing a compliment all those times. So naturally, it’s a perfect time to revisit a video game meme with deep roots in the Kotaku weekender community and, more specifically, the ‘Shop Contest. Feel free to stick with the iconic green-screen intro or venture outside into other parts of the game. The choice is yours! Only the baddest, dudest entries will be able to rescue the ‘Shop Contest from oblivion. 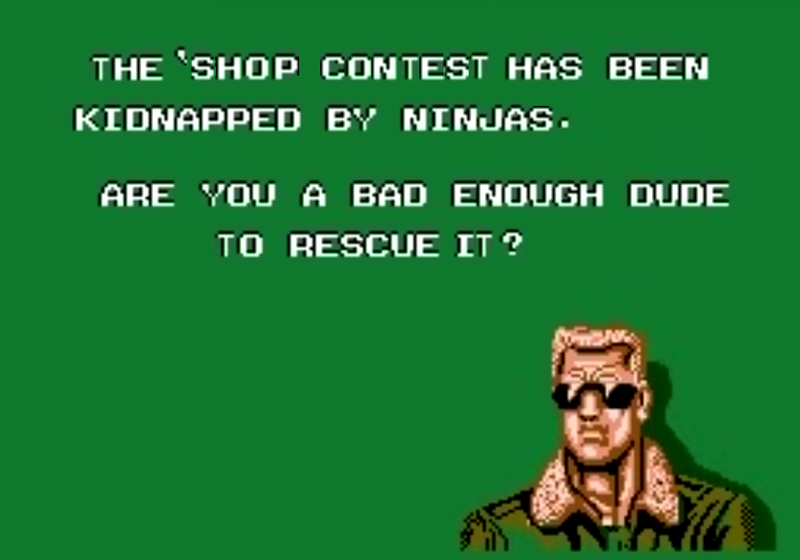 Who knows, your entries might even be so on point that Ninjas do in fact get inspired to go and kidnap the President. The rules are below. See you next weekend with the winners!